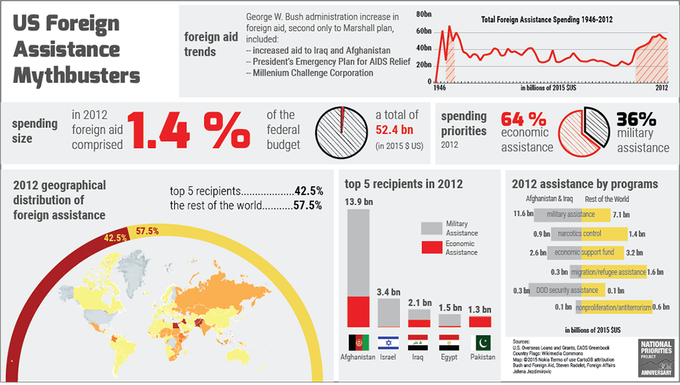 Did you know that United States spends approximately 1% of the federal budget on foreign aid? According to research performed by Kaiser Family Foundation in 2015, only 1 in 20 Americans answered yes to the question above. On average, Americans believe that approximately a quarter of the US federal budget is spent on foreign aid. Developed countries are often ranked by the percentage of GNI (gross national income) that they allocate for foreign assistance, a good measure of how globally “generous” a society is. According to OECD figures, Scandinavian countries lead the list when it comes to foreign aid generosity in relative terms, while the US lags behind. In terms of the absolute dollar value of aid provided by each country, the United States ranks at the top, reflecting our large size and economy. 2) The top five country recipients received nearly half – 42% -- of US foreign aid, primarily to shore up U.S. security concerns. While many of us think of humanitarian aid when we think of foreign aid, since 2001, US foreign aid has been increasingly driven by national security interests. In 2012 all of the top five foreign aid recipients were located in Middle East, reflecting the US tendency to distribute aid based on military and security concerns. Foreign aid to Iraq and Afghanistan reflected the US military involvement there, led by security assistance and redevelopment. Generous aid to Israel, Egypt and Pakistan similarly reflects US security concerns. 3) The biggest increase in foreign aid since the aftermath of WWII and Marshall Plan happened during the George W. Bush administration. Think progressives lead the way on foreign aid? Think again. 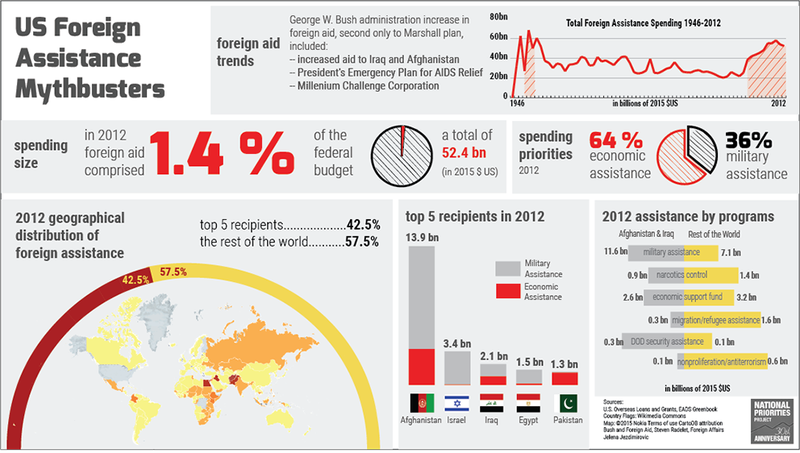 In 2002 George W. Bush proposed an increase of 50% in the foreign aid for the following three years. The proposed increase was supposed to fund two new Presidential initiatives: the President’s Emergency Plan for AIDS Relief and the Millennium Challenge Corporation, along with increased aid to Iraq and Afghanistan.